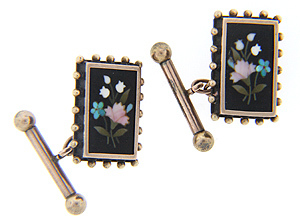 Lovely pietra-dura floral designs ornament this antique cufflinks. Beadwork outlines the rectangular faces of the cufflinks. A simple bar and chain design serves as the connector and backs for the links. The rectangular front faces measure 3/4" by 9/16”. Circa: 1880.